A devastating earthquake hit off of the coast of Japan at the end of last week. The devastation of the earthquake and the tsunamis that followed has been horrendous. The nation is experiencing the largest disaster it’s seen since the end of World War II. As international allies rise to give Japan aid, the gaming industry within the nation’s borders and without is doing its part. There are several instances of goodwill cropping up as time passes from the initial date of the disaster. Andriasang has reports of major companies and their donations. For perspective: 100 million yen is about $1.2 million. As previously reported, 5pb. will slash the price of iOS Memories Off 6 T-Wave from ¥2,000 to ¥350 and will donate all sales of the app through March 31. There have been mentions of possible support as well. BlazBlue producer Toshimichi Mori said that he will discuss with Arc System Works the possibility of creating some sort of download content for PS3 and Xbox 360 and donating some of the proceeds to relief efforts. In addition to that relief, Square Enix has shut down the servers of Final Fantasies XI and XIV in an effort to conserve energy. In a completely separate act, the owner of an extremely rare original Nintendo DS is auctioning their system off on eBay. The device has been autographed by a few of Nintendo’s elite. All proceeds from the auction will be sent directly to the Red Cross for disaster relief in Japan. As of writing this story, the DS sits at $1,125. As the nation of Japan attempts a slow return to normalcy, industries, organizations and individuals will continue to do their part and volunteer aid for the country. While this enormous tragedy has been awful, it’s been amazing to see an outpour of support. 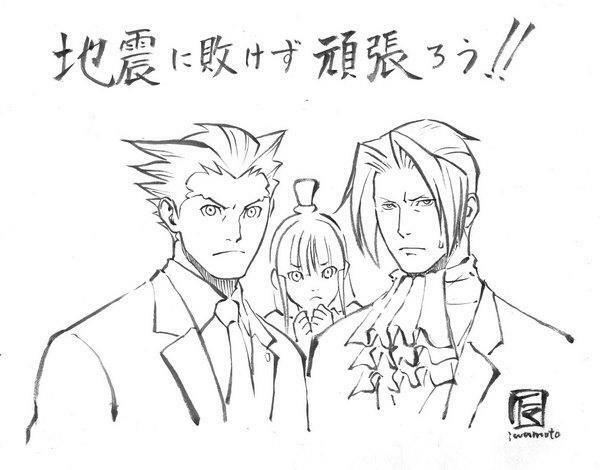 The image in this post comes courtesy of Ace Attorney series art director Tatsuro Iwamoto via Tiny Cartridge. According to them the translation reads “Let’s work hard and not be defeated by the earthquake! !”, which is amusing as one of the characters is afraid of earthquakes.